Tag, you’re it! These holiday gift tags will definitely make you get that ‘it’ factor you were always looking for. The holiday season is a time for presents (oh, and family), so get your family the best presents you can get. These gift tags will just be the icing on the cake. Personalizing your gift is always a smart choice, especially when you’re trying to be the favorite of the family. The 'From' can read ‘your favorite child’. Once your parents take one look at this gift tag (front and back) you’ll seal the deal. Make it extra special by crossing off the 'From' and putting Love. (*Awwwww*). 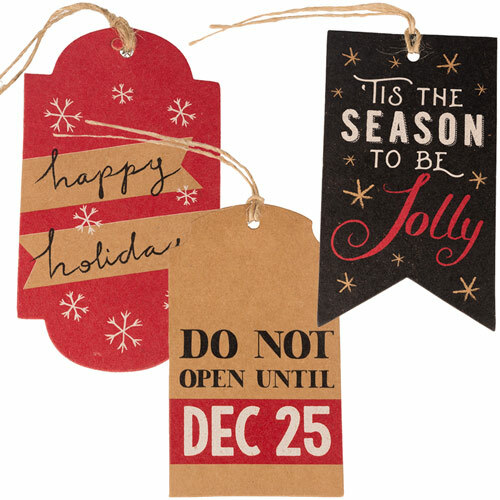 Made for the Macy’s Designer Collection, these gift tags are great for that festive spirit we all have (or desire to have) during the holidays. So whether you're faking that spirit or actually feeling it, these tags will be there to help. Be that ‘It’ Girl or Boy and get these now. All gift tags say “To:” and “From:” on the back.